Guitar maestro Yngwie J. Malmsteen's third album as a solo artist is grand, artistic, and self-indulgent. Trilogy is also quite good. That three-headed flying dragon on the CD cover? He doesn't even stand a chance against Malmsteen's wizardry. Malmsteen's classically-inspired metal guitar is of course front and centre, and it sizzles on a regular basis. 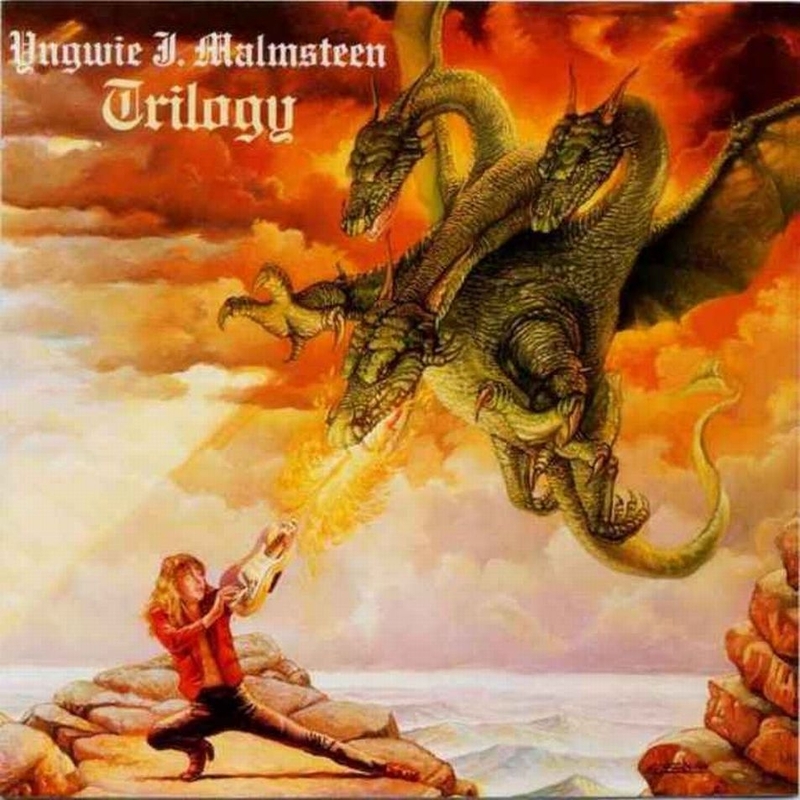 Every Trilogy track is constructed to showcase Malmsteen's talent to good effect, and he never disappoints. The standout selection is the album closer Trilogy Suite Op: 5, Mamlsteen leaving no doubt with that title that he imagines himself to be an artist to rival the great classical composers. But arrogance when backed by talent is tolerable, and Malmsteen walks the talk: Trilogy Suite Op: 5 is seven minutes of metal guitar magnificence, Malmsteen combining elaborate classical melodies with breakneck speed and stunningly accurate delivery. The acoustic interlude works as intended, and the track builds to a towering, domineering height rarely achieved by instrumentals. The other instrumental track is the quietly influential Crying, which starts with the acoustic guitar and elegantly transitions to full metal shredding. The rest of the album does feature vocals, an element that Malmsteen must have always regarded as an evil necessity rather than a complement to his music. Mark Boals is pressed into microphone duty, his first collaboration with Malmsteen, and Boals puts on the typical performance of a vocalist playing third banana to the axe-man: desperately overloading the limp lyrics with artificially pumped emotion. Boals has range, but the truth is that here he is irrelevant. Of the seven songs with vocals, Queen In Love works best and brings the beef to the table, Malmsteen slowing down and allowing some crunch to share space with the solos. Trilogy is Malmsteen at his best, unapologetically brandishing his talent, and when you're this good, it is hard to be humble. Yngwie J. Malmsteen - Guitars and Bass. Produced by Yngwie J. Malmsteen. Engineered by Ricky Delena. Mixed by Ricky Delena and Yngwie J. Malmsteen.